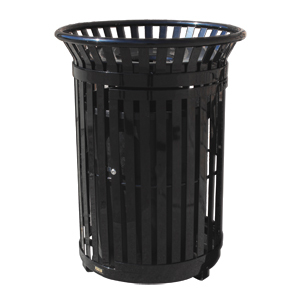 This Premier Style Trash Receptacle features a flared top that makes it easier to dispose trash into the waste can. Model with key-locking door swings open 180° for full liner access enabling easy removal and replacement of the polyethylene liner. Side mounting Ash Receptacle is also available for proper cigarette waste management. These powder-coated steel 'Premier Style' trash receptacles are available with several versatile options designed to suit your needs. To make your ordering process simple please follow the easy 3 step ordering process. 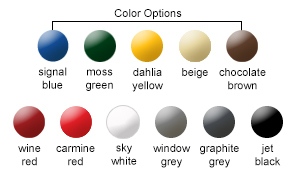 Select Model (A or B) and Choose receptacle color. (I) Enter the Quantity of the complete trash can(s) you would like to order. 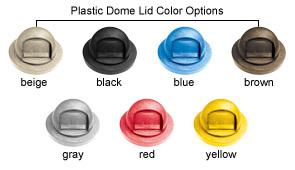 Standard 34 Gallon Polyethylene Liner.